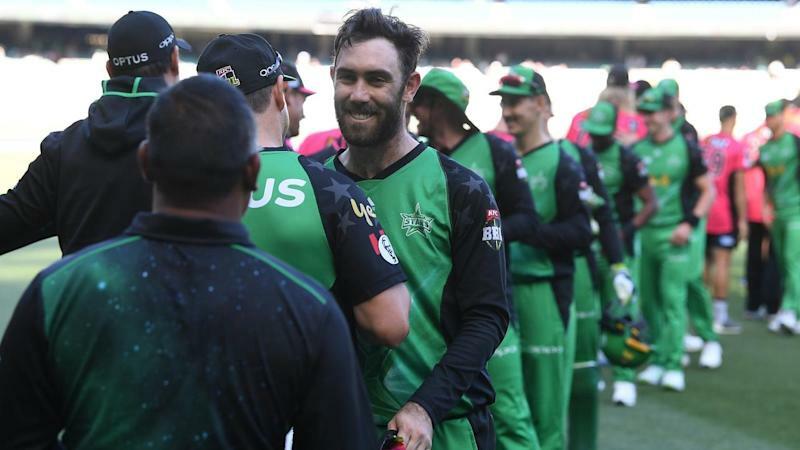 Glenn Maxwell's MCG heroics have ensured Melbourne Stars have momentum on their side ahead of a BBL semi-final clash with minor premiers Hobart Hurricanes. The Stars skipper delivered a stunning batting performance on Sunday to propel his side into the final four and deny the Sydney Sixers a home semi-final. Maxwell smashed six sixes on the way to 82 off 43 balls, remarkably lifting his side from 4-101 at the 16-over mark to a total of 6-168. The Sixers were skittled for just 74 in reply as Nepalese legspinner Sandeep Lamicchane snared 3-11. Having leapfrogged Brisbane Heat to finish in fourth place, the Stars will take on the Hurricanes at Blundstone Arena on Thursday night. The Hurricanes boast the BBL's two leading run-scorers in Matthew Wade and D'Arcy Short and are unbeaten at their home ground this season. A buoyant Maxwell declined to elaborate on the Stars' strategy for Wade and Short but was confident the in-form pair could be stopped. "We'll come up with our plans," he said. "I thought we actually bowled pretty well to them in Hobart when we played them the first time. It's just we probably missed a couple of chances when we were a chance to get back into the game. "We dropped (George) Bailey early and he was able to control the back end of that innings. I thought we were able to maintain the game pretty well, we just let a couple of opportunities slip." Sunday's dramatic finish to the regular season ensured the Melbourne Renegades will host Friday night's second semi-final against the Sixers. The Sixers had needed to score at least 107 to keep their net run rate above that of the Renegades and retain semi-final hosting rights. Just three Sixers batsmen managed to reach double figures with Daniel Hughes' 12 the top score. Skipper Moises Henriques conceded the Sixers batsmen had been preoccupied with the 107-run target and batted within themselves. "The plan was still to win the game but I think in the back of everyone's heads, we knew the total that we needed to get to," he said. "It probably wasn't a good thing in the end because you start getting a little bit timid ... their bowling attack never felt under the pump or under any sort of pressure from our batters."